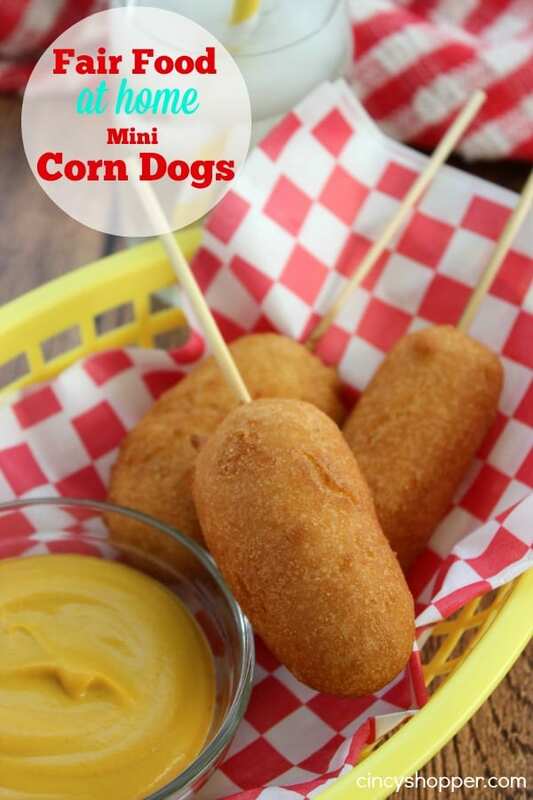 It’s Fair Food at home week and this Mini Corn Dogs Recipe is going to have you reminiscing back to the fun days at the fair. Corn Dogs have always been a fair favorite for me. Growing up we didn’t have the new convenient corn dogs in the frozen section so we only enjoyed corn dogs at the carnivals and fairs. Now that we have corn dogs in the frozen section my kiddos will beg me to purchase them. That was up until a few weeks back when I made some Home Corn Dogs that have now become their favorite corn dogs. The whole house loved our Fair Food at Home we shared with you yesterday, Funnel Cakes at Home. They were so tasty and had us all wanting to make them almost daily. This Corn Dog Recipe has been just as much of a hit and will save me some $$’s come festival and fair time (which is not far off). Making Homemade Corn Dogs is more simple than I had expected. The process is so simple if you place your batter in an upright container for dipping. The most difficult part is keeping yourself from consuming them while the next batch is cooking, ha ha! 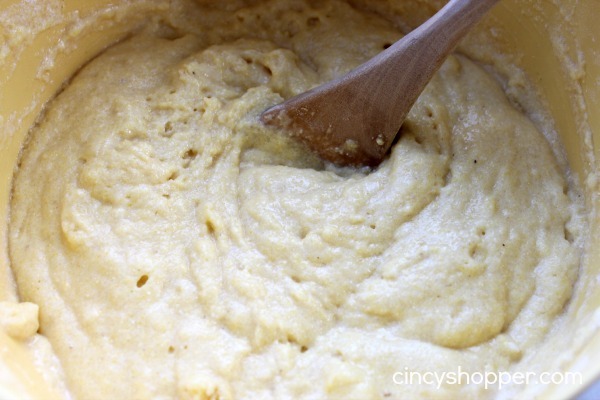 Mix together cornmeal, flour, salt, sugar and baking powder. Add in eggs and milk and mix until blended. Transfer mixture to tall glass or mason jar. Preheat oil in a saucepan over medium heat. 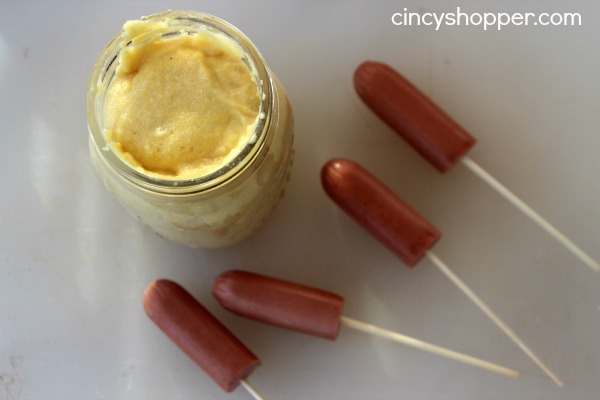 Insert skewers into wiener halves and dip in batter until well coated. Rotate to allow excess to drip off. Fry corn dogs one or two at a time until lightly browned. 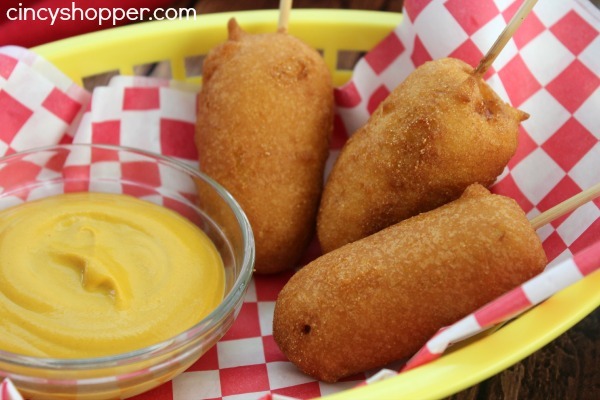 We love our Homemade Corn Dogs with Mustard. The kiddos even dip theirs in a spicy mustard that they LOVE. Homemade Corn Dogs are going to be great for us to have for our lunches over summer break. I am looking forward to not having to purchase corn dogs at the festivals and fairs this summer (saves me BIG $$’s). 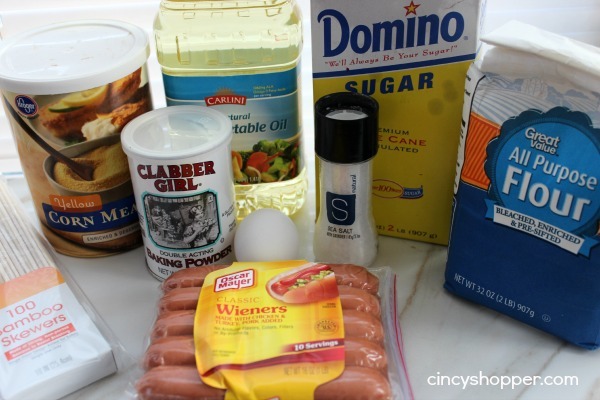 If fair food is popular with your family, be sure to drop back by CincyShopper every day this week for a new and fun Fair Food Recipe. These look so so good!!!!! I’ve been wanting to make homemade corn dogs for the longest time!! These look so delicious! I LOVE LOVE LOVE corn dogs! This is a must make recipe!!! Thanks for sharing this great recipe at THE SCOOP! oh I tried making them using cornbread mix and it didn’t work out. Thanks for this recipe!! I will be using it for sure :) Pinned! Yes, Yes, Yes! I am so excited to have this recipe, I love corn dogs can’t wait to make these. Thanks so much for sharing this awesome recipe with Full Plate Thursday. Hope you are having a great weekend and come back to see us real soon! Gosh I love fair food and always am sad when the fair leaves town. This is a great recipe to help curb the nostalgia!